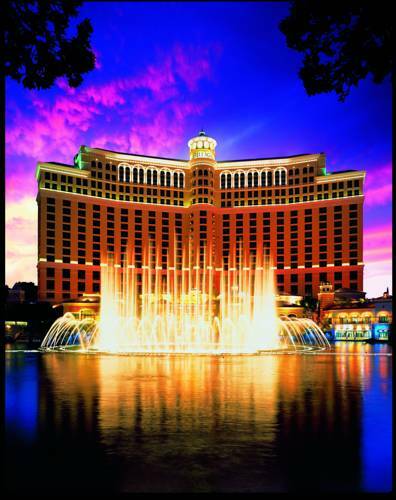 Inspired by the villages of Europe, AAA Five Diamond Bellagio overlooks a Mediterranean-blue lake in which fountains perform a magnificent ballet. The resort offers elegantly appointed accommodations paired with modern conveniences similar to the warmth of home, offering sweeping vistas of the lake at the resort, surrounding mountains and Las Vegas skyline. Within the resort are award winning dining experiences featuring two AAA Five Diamond restaurants Picasso and Le Cirque. Bellagio is also home to four James Beard award winning chefs including Julian Serrano. His latest culinary masterpiece, Lago, showcases innovative Italian small plates overlooking the fountains of Bellagio. More recently, the resort has proudly unveiled Harvest by Roy Ellamar, a defining example of new American cuisine. Lavish shopping, a world class art gallery, the exquisite Observatory and Botanical Gardens, a wedding chapel, spa and salon, dynamic nightlife and elegant casino are sure to exceed expectations time and time again. Indulge in the luxurious Chairman*s Lounge, which offers a private registration and concierge experience. All reservations require a credit card, which will be charged for the first nights room and tax at the time of booking. All reservations must be cancelled 72 hours prior to the arrival date to avoid a one night room and tax no show charge. Star chef Michael Mina creates an innovative seafood menu with a distinct blend of California and Mediterranean ingredients at his celebrated namesake restaurant. Dine in an elegant, yet relaxed atmosphere complemented by an extensive selection for distinguished wines from around the world. Outdoor pedestrian promenade surrounded by 10 casino/hotels. A one-of-a-kind Light and Sound Show derived from over 2 million lights and 540,000 watts of concert quality sound, is presented each night hourly after dusk. A multi-story gift shop full of M&M branded merchandise and vestiges of the less-successful World of Coca-Cola.